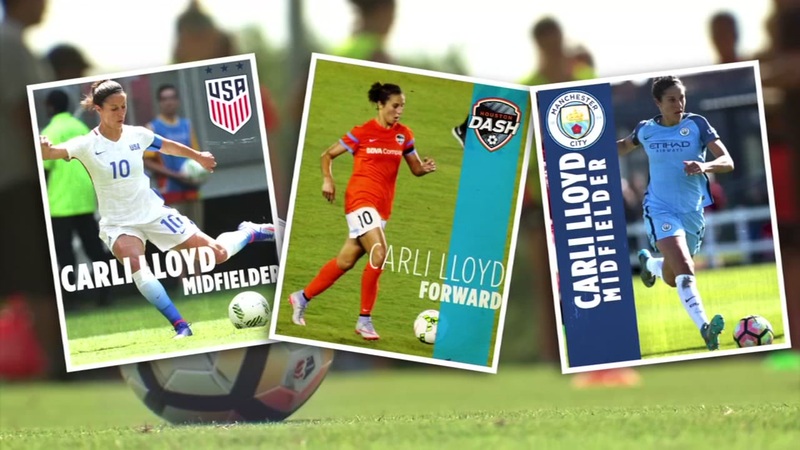 HOUSTON (KTRK) -- With Olympic gold medals and a World Cup championship, Houston Dash player Carli Lloyd has scored some of the biggest, game-changing and match-winning goals in women's soccer. Until now, Lloyd has been having a whirlwind year. An MRI of her ankle sprain later this week will reveal the extent of her injury. Lloyd is on the roster of three soccer teams this year -- the U.S. national team for the Tournament of Nations, just after rejoining the Houston Dash a few weeks ago. She spent the spring playing for Manchester City Women in the United Kingdom, on a soccer pitch right around the corner from the site of May's terror attack. "Life is too short," said Lloyd. "You just never know what can happen. I'm a big believer in making the most of every single day, whether you're struggling with something or something is a bit tough that day, you always have to put life into perspective." Soccer has been a part of the 35-year-old's life for as long as she can remember. "I loved it from an early age," she said. "I was always outside playing, I was playing with the boys. I was really playing any sport that I could get to be a part of. I've loved it ever since and I had that will and desire and everywhere I went, a ball came with me." Lloyd has made her mark as one of the greatest scorers in U.S. soccer history, decorated with Olympic gold medals and a World Cup championship. As for the career moment that tops her list, she said it's more about the struggles than the wins that have made her a standout player. "I look at all of the good moments I've had in my career, but I also look at the not so good moments," she said. "The times of struggle, the times of obstacle, the times where people have doubted. Without the complete journey and without all of the struggles and triumphs, it wouldn't be my journey." Lloyd credits being cut from the U.S. under-21 team in 2003 as one of her toughest, but most character building breaks. While she admits talent will get you in the door, she said it's dedication, determination and character that will keep you there. "I hope I've inspired others to dream big, because 10 years ago, when I said my goal was to become one of the best players in the world, there were people laughing at that," Lloyd said. "If you work hard every single day, no matter if anyone tells you that you can't do it, you can do it."